What do you do on the new year? One of my favorite things to do is to think of the year just passed. Where did I go? What did I do? What was great, and what was difficult? And when I look at a few things, it really was a hectic year! Today was so glorious that I couldn’t bear to be in my “office.” I slung my handbag over my shoulder and set off, camera in hand. And then, all I could think about was, get this, being in my peaceful quiet “office,” creating! Who knew? So, upon creating, my first thought was it was a leap year ! Oh no, 366 photos to take, then I was reminded, it was no leap year, whew! One less photo to take! Questions are being spun in my head right now, to take 52 photos, or to take another 365 journey. If I do that, this is my first photo to the list!!! I cannot help but personalise, prettify, and pimp everything I get my hands on. 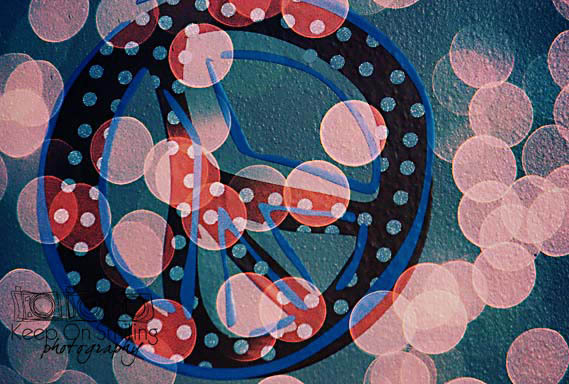 So, I had to take my orange and blue WAR EAGLE peace sign, and turn it into stunning BOKEH! YEAH!!! I wish everyone, PEACE LOVE AND HAPPINESS OF THE NEW 2015! and I have a wish for myself, while, I am wishing everyone else, I’m going to need courage, and people to help me along the way complete this project! So, I wish for you guys to encourage me along the way to create some beautiful photos that you and I can look at through out the year, and yes, each picture that I take is available for prints for sale. And you can also use them, just please respect my logo!! !